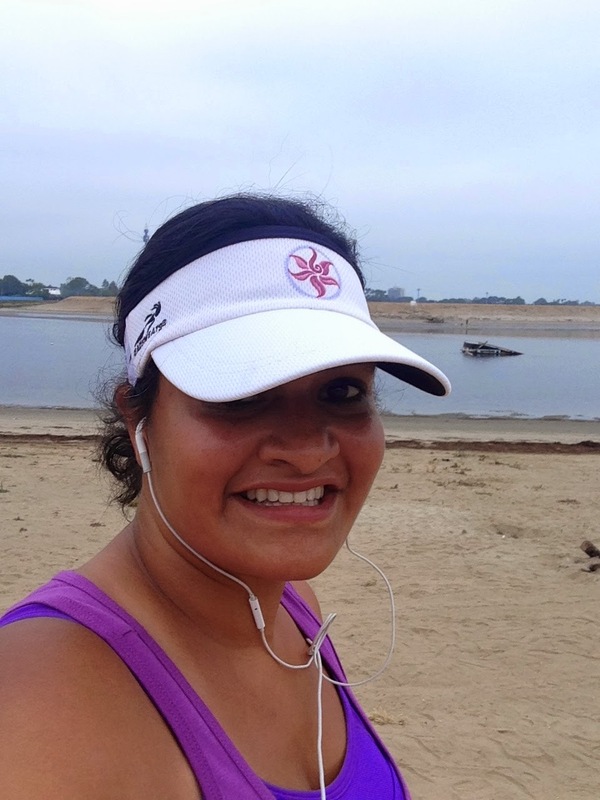 Running with SD Mom: Thoughts on Running Solo and a Recipe you DON'T WANT to SEE! 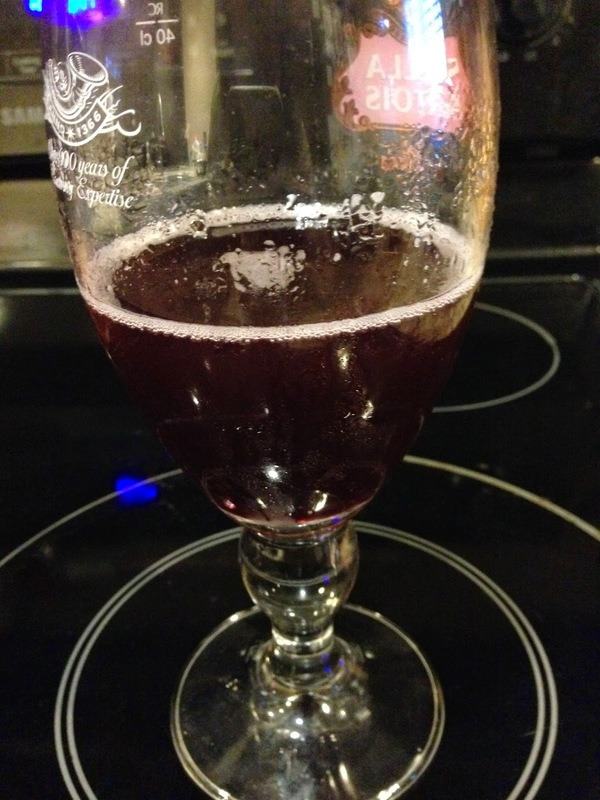 Thoughts on Running Solo and a Recipe you DON'T WANT to SEE! So my dear running partner Danielle was out this weekend with an IT band injury. We had planned for 7 miles at our favorite loop and when she texted me Friday night and said she couldn't, I was left with a choice. Run (GASP) alone or find some one else or don't run at all (double GASP!)! I made a the adult grown up choice to run alone. I was super nervous for several reasons. One, I have NEVER run more than 6 non-race miles alone. 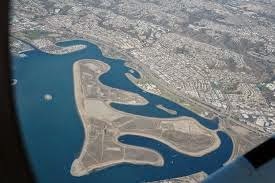 Two, I decided to take myself completely out of my comfort zone and head to Fiesta Island in Mission Bay instead of my usual run. So, the ultimate test. Did I have enough passion to get thru this 7 miler on my own? Turns out, not only did I have enough passion for 7 miles, I had enough passion for 9.5 miles. Mostly because I got LOST! I do look a little terrified here. Admit it! (Side Note: All you great bloggers who have great pics of you running? HOW DO YOU DO IT? I look hideous!) But guess what, 9.5 miles later, I was back to my car and asking some kid to take a picture of me! - My run, my pace. No feeling guilty you are holding anyone up or going too fast. - My location choice. I don't have to worry about anyone else driving too far. If I want to run by the beach, I can. If I want to run around my 'hood, I can. My choice. - My time of day. If I want to run at 5:00 a.m., I can! If I feel lazy and want to run at 7 instead, I can. - No one to push you into not quitting. - No one to push your pace. - No one to talk to or gossip with. - No one to take a picture of you running! In conclusion, I think I am a social runner. I run for health but I also run for friendship and a community. I think an occasional solo run would be good for my soul but not more than 5 miles. I like the change up of location though. So to my MRTT running friends, please don't stop running with me. I need you! So my Garmin told me I burned over a 1000 calories on my run. So what did I do? 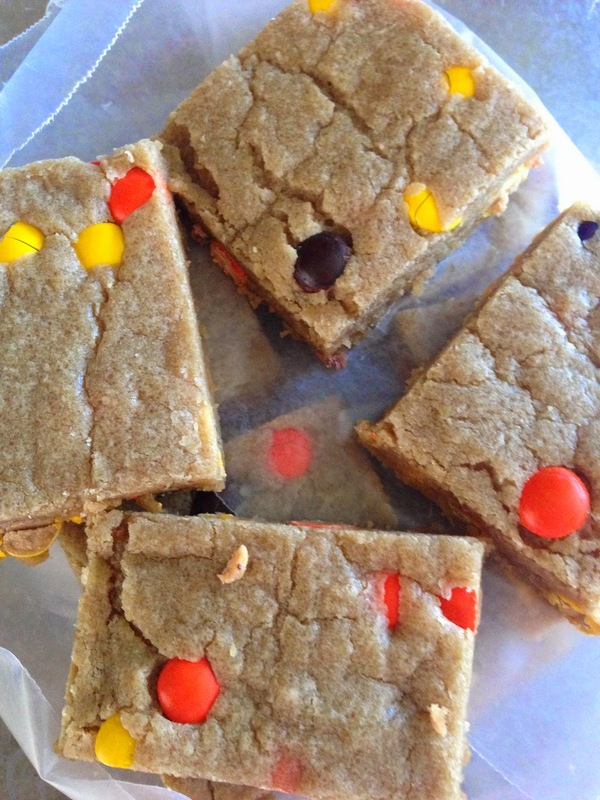 I made Reeses Pieces Cookie Bars. STOP READING NOW! There is nothing good about these buttery squares of heaven. NOTHING GOOD! TURN AWAY!! These cookies bars are originally from a website www.lizzygoesdutch.blogspot.com but I can't seem to click into it. 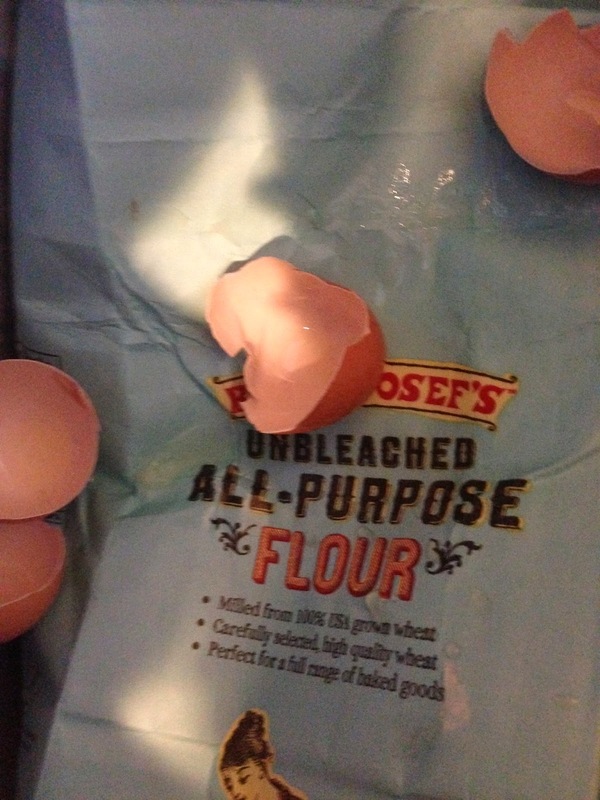 Good thing I saved the recipe and modified it over the years. Again, please don't send me hate mail about how bad these bars are. I already know. 1. Preheat oven to 325• and place the rack in the lower middle section of the oven. Line a 9x13 glass baking pan with foil so that it over hangs the pan. Spray foil with cooking spray or butter. This is a good time to melt that butter and set it aside. 2. 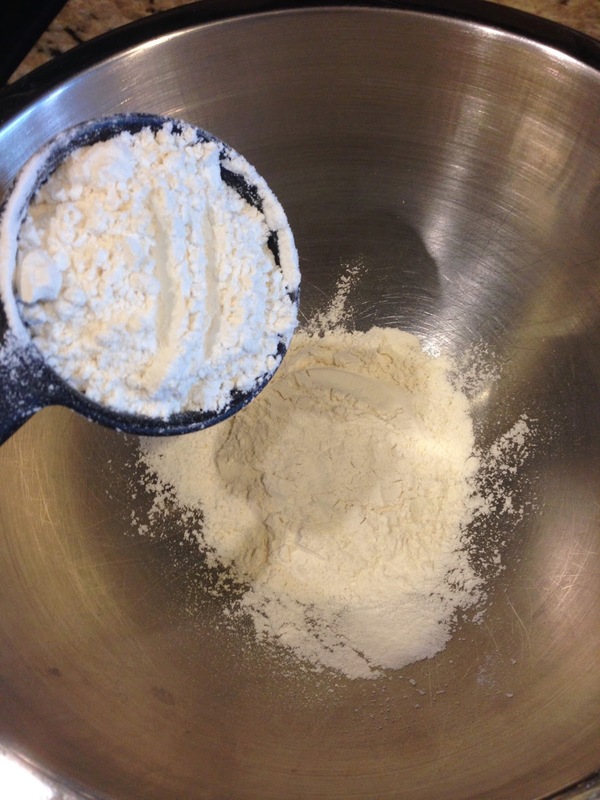 Mix flour, salt and baking soda together in a small bowl and set aside. 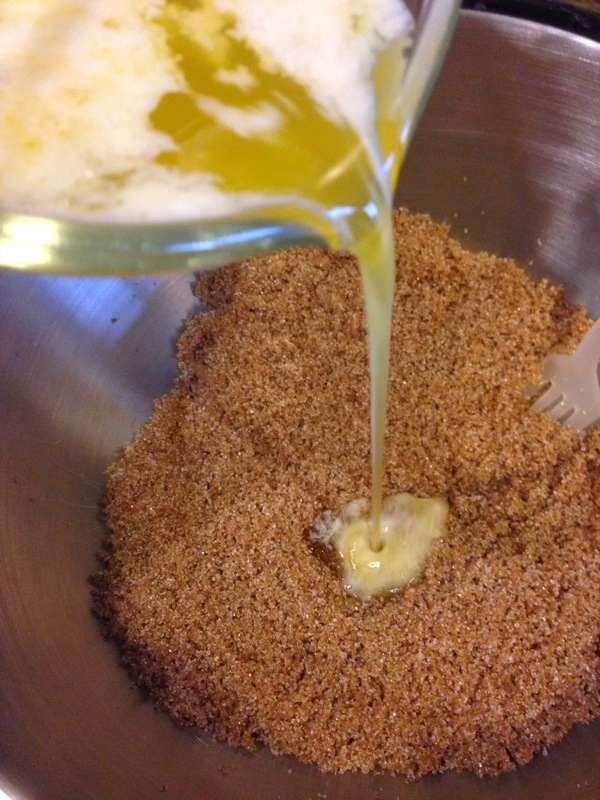 Put the sugars into a large bowl and drizzle in butter and mix well until combined. Add in the egg, egg yolk and vanilla and mix together again. 3. 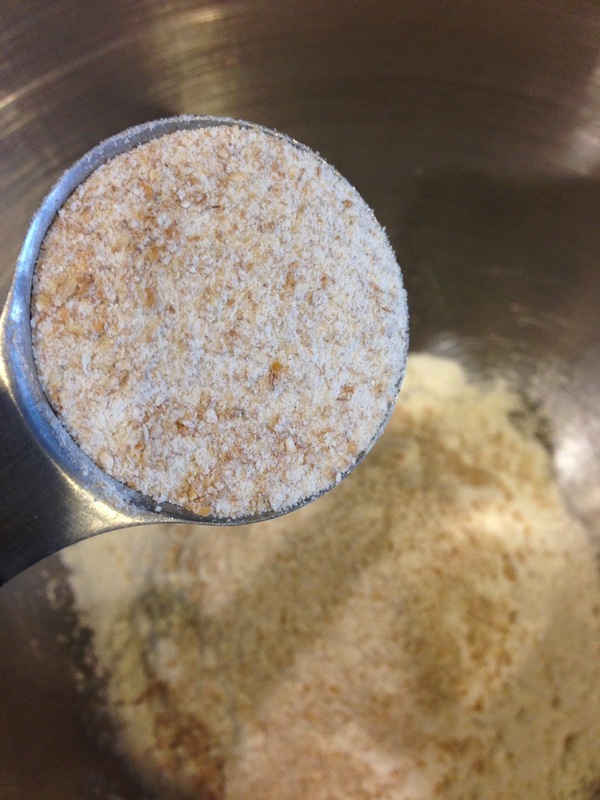 Dump flour mixture into the sugar mixture and mix until just combined. Don't over mix! 4. 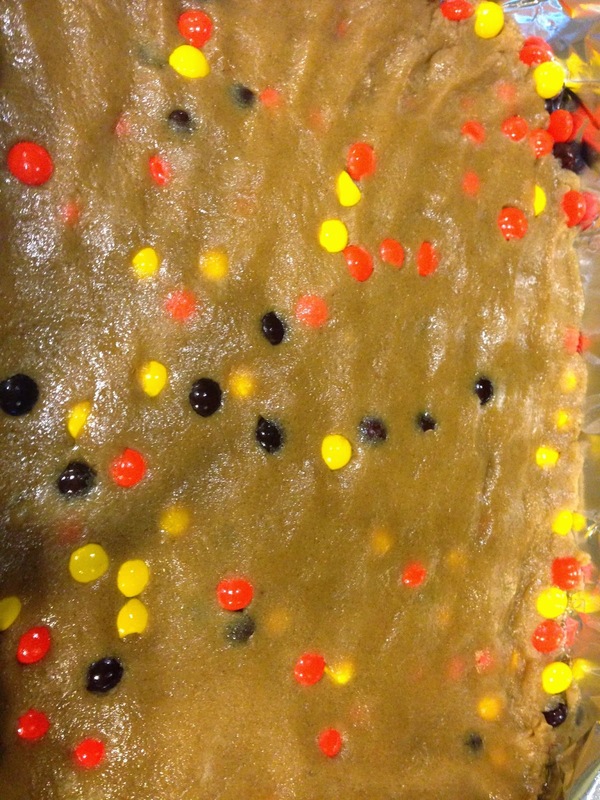 Add in the cup of Reeses Pieces and try to get them evenly into the dough. 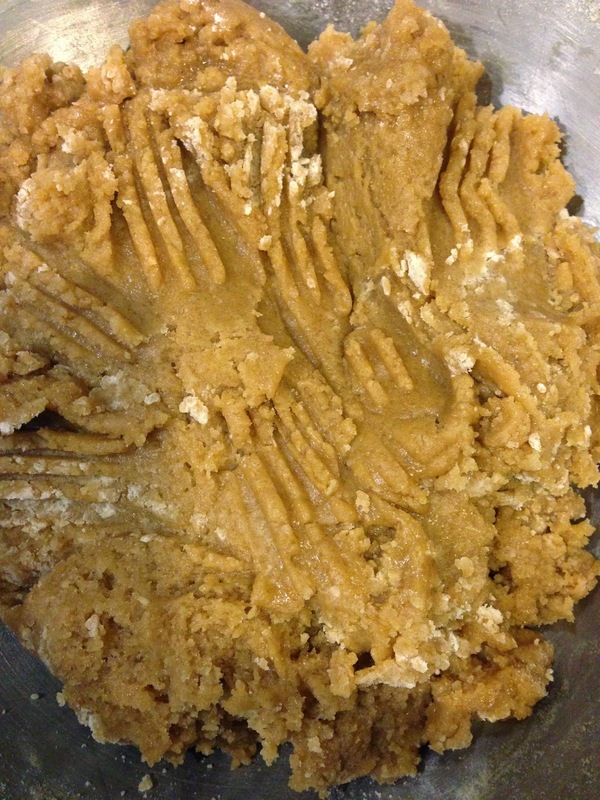 Dump the dough into the prepared pan and smooth out with hands. Bake up to 28 minutes (Mine only takes 23 mins) until it just begins to brown and pull away from the edges. Don't overcook it! 5. Pull the bars out of the pan using the foil over hang and set on a clean dry kitchen towel. Once cool, you can slice into bars and remove foil. ENJOY! Phew! All done! Okay, now I have questions for you! 1) What do you do with the whites from that egg yolk I needed? I hate throwing it away! Maybe an Orange Julius? 2) Do you run alone? With a BRF? With a group? And Danielle, please get back to 100% soon. I need you! Great job on the run. I actually run most of my runs solo. I just like to step out my front door and get it done instead of figuring out when and where to meet up. Stop by and join the Tuesdays on the Run linkup! I'm totally opposite of you. I run about 98% of the time alone. I've been running since 1998 and of all those runs between then and now, I'd say about 2% was with someone. 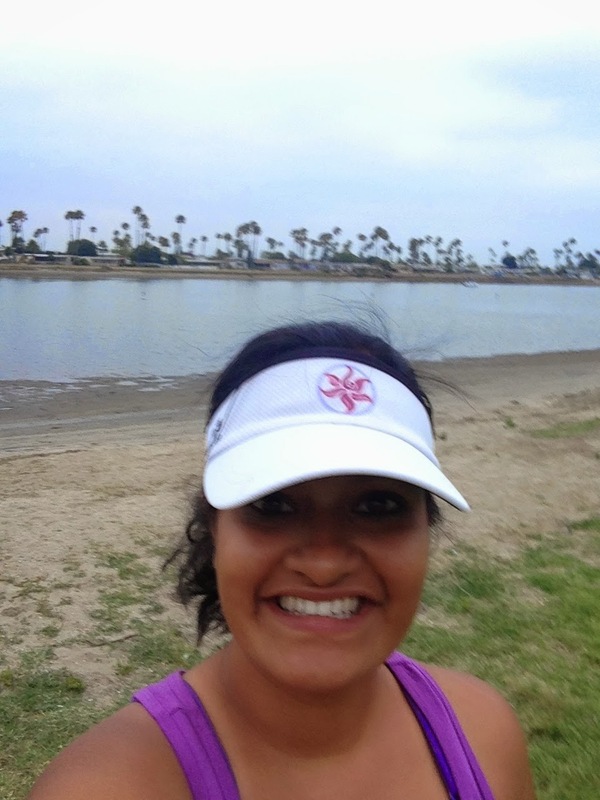 I even did my marathon training alone! I guess I'm a loner runner. I like to plug in my music or a podcast or listen to silence and just go. I also dislike having to match pace (I'm slower than a lot of my friends) and time (my schedule is tight and I need to run when it's good for me) and location. That said, there ARE times I do run with friends and those times have always been enjoyable for me too. But by and large, I like to run solo. This does NOT mean I don't want to run with you sometime though!